Palette42, 5126 N.E. 42nd Ave., opened in May and offers an eclectic and multicultural blend of items by local entrepreneurs and consigners. Bobbie Stewart’s shop is a unique business model that offers local designers, makers, artists and authors a place to showcase and build their businesses, and offers customers a place to shop for local artisan items from clothing to books to beauty products to coffee. 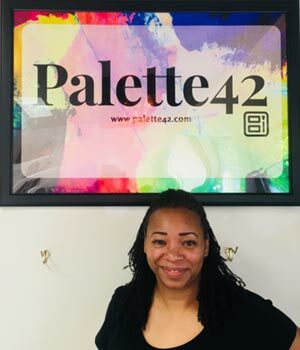 Bobbie created Palette42 to help multicultural brands grow from startup to mainstream. “This is a teaching store in which a lot of people are given the opportunity to work as a collective to build their individual brands,” she pointed out. Bobbie has lived in northeast Portland since age 2, and her commitment to community stands out – especially during her difficulty finding a retail space to lease, initially as a boutique combined with a natural hair salon. She would call about spaces for lease and say she was an African-American business serving African-American women. Frequently she would not receive a call back. So she created her current business model of a boutique that recruits entrepreneurs to lease space, requires a modest rent and labels each product with its maker’s information so customers can find the product again. Each retailer has a business license, insurance and the social media necessary to drive people to the shop. With the opportunity for a three- month lease to try out selling at the retail level to a one-year lease with retirement investment, her unique model is one that gives new businesses a chance to grow. Soapbox Theory, dishware and lunch boxes for boys and girls printed with images of children in many shades of brown. Designs by Le’yon The space is one in which customers can touch, smell, and try things on with price points from $5 to $40. Interested in selling there? Visit the shop Mondays through Saturdays from 11 a.m. to 7 p.m., or apply at Palette42. com. Rachel Richards is a 16-year Concordia resident who loves her community. She has a background in counseling/education and uses her passion for helping others in her work as a real estate broker. Contact Rachel or learn more about her at RachelRichardsRealtor.com.